Discussion in 'The Cocktail Lounge' started by mjoke, Oct 13, 2018. Ok guys, how are we doing? ... i got some stories to tell haha! But at this point i need whoever is from the old site, eg mr weeekend or anyone else who knows about overseas stuff, *smirks* i wanna send some funds back here, and there is an issue which i cant let the G man see it.. So ummmmm yeah, i had some btc ...i also got 1099 by a casino for 10m which is a story on its own and kinda what ive been doing,.. long long story.. but yeah id like to see a roll call whos here, ... are we all alive? and good? Hell froze over and the sky is falling now... buahahahaha..i miss the old site, where is my stuff dam it! OldFart, StockJock-e and bigbear0083 like this. holy cow! @mjoke is back! it has been a while? really good to see you're still alive and kickin' man! i was actually just reminiscing the past a little the other week, and remembering all the good times we had over on the old hsm. this site has changed a lot. you won't find many of the former old timers like mr weekend. however, some of the really old timers like @bigbull, @OldFart, @fireopal still do check in here from time to time. unfortunately, one of our old time greats did pass away last year though (@Tiptopptrader ) you remember him right @mjoke? ^^ many of them haven't checked in for a while however. i won't spam your thread further though haha. anyway, it's really great to see you back in action mjoke! i gotta let @StockJock-e know of this good news! the boards here aren't quite nearly as active as they were on HSM...but i'm hoping that won't turn you away from sticking around and participating on the discussions (especially the weekly discussion threads). we've been seeing a nice influx of new arrivals joining the site of late however. ive been here for awhile now, just didnt get the conf email...... .and ya i remember tip, i think weekend is gone too.... i hope not. I try to make an appearance when I can (enickma on old board), but my life is SUPER crazy busy these days, and this past year I was only able to check in a few times. I'm starting to ramp up my Forex activity, so I'll probably be logging in and posting a bit more often. Merry Christmas and happy new year everyone! hah, i knew that avatar looked awfully familiar! StockJock-e and enickma like this. enickma and bigbear0083 like this. Glad to be back. The past several years have been an interesting journey. Aside from normal stuff like 401ks and college accounts for kids, I'd largely stepped away from trading to focus on my career. I've been specializing in cloud infrastructure security, and my schedule is nuttier than Snickers. I still don't have free time to trade, but I do now have the ability to write robots to trade for me. I'm working on perfecting an MQL4 Forex trading robot at the moment, and the vision is that while I hop around from plane to plane with no time to do anything, my robot executes my trading strategy. Pretty well the only way I can do anything these days, is by automating it. Hope everyone else has been good. Have missed yall. I'll be around more going forward, as I can finally get involved in trading again, albeit in a different way. bigbear0083, StockJock-e and OldFart like this. 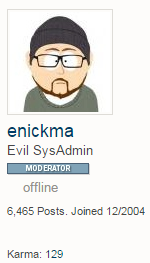 Petition to change your name back to enickma! Isn't it amazing how quickly things have progressed in this area? With Oanda I can either use Metatrader's MQL4 language, a brand new REST API, or even a new "Algo labs" thing they have to make automated trading approachable for non-programmers. Love it. Automation isn't suitable for all trading styles, but IMO if you can boil your strategy down to a series of if/then conditions, then you're in good shape for it. This is of course much easier for TA-based strategies. ^^ wow just saw your name @enickma which i remember from HSM so hello! !